BOSTON — Sun-drenched rooms make for happy residents, but large glass windows also bring higher air-conditioning bills. Now a bioinspired microfluidic circulatory system for windows developed by researchers at the Wyss Institute for Biologically Inspired Engineering at Harvard University could save energy and cut cooling costs dramatically — while letting in just as much sunlight. The same circulatory system could also cool rooftop solar panels, allowing them to generate electricity more efficiently, and prevent heat loss in winter, the researchers report in the July 29 online edition of Solar Energy Materials and Solar Cells. The circulatory system functions like those of living animals, including humans, which contain an extensive network of tiny blood vessels near the surface of the skin that dilate when we are hot. This allows more blood to circulate, which promotes heat transfer through our skin to the surrounding air. Similarly, the new window-cooling system contains an extensive network of ultrathin channels near the “skin” of the window — the pane — through which water can be pumped. The channels consist of long, narrow troughs that are molded into a thin sheet of clear silicone rubber that, when stretched over a flat pane of glass, create sealed channels. “The water comes in at a low temperature, runs next to a hot window, and carries that thermal energy away,” said Benjamin Hatton, Ph.D., lead author of the study. Hatton, who is now an assistant professor of materials science and engineering at the University of Toronto, was a member of the Advanced Technology Team at the Wyss Institute. He worked on the Adaptive Material Technologies platform led by Joanna Aizenberg, Ph.D., who is a Core Faculty member of the Wyss Institute and the Amy Smith Berylson Professor of Materials Science at Harvard School of Engineering and Applied Sciences. Today’s insulation and construction methods do a good job keeping heat from leaking through walls, but heat transfer through glass windows remains one of the major stumbling blocks to energy-efficient buildings. In large part, that is because the molecules in glass absorb the sun’s infrared light, heating the window, which heats the air inside the building significantly. The idea to cool glass windows when they get hot emerged from work on microfluidics by Don Ingber, M.D., Ph.D., the Wyss Institute’s Founding Director, and his team working on biomimetic microsystems. Ingber is also the Judah Folkman Professor of Vascular Biology at Harvard Medical School and Boston Children’s Hospital, and Professor of Bioengineering at Harvard School of Engineering and Applied Sciences. Microfluidic devices circulate fluids through tiny, ultrathin channels and are typically used to build small devices for laboratory research and clinical diagnosis. In contrast, Ingber’s team developed an innovative method to build large-scale microfluidic devices for organ-on-chip applications. They first use a vinyl cutter — a computer-controlled device that cuts intricate patterns on large vinyl sheets — to create a plastic mold. Then they pour liquid silicone rubber into the mold, let it solidify, and remove it, which creates the thin sheet imbued with long, narrow troughs. When Ingber’s microfluidics team met with Aizenberg’s adaptive materials team in cross-platform meetings, the idea emerged that this microfluidics technology could be applied to building materials to control heat transfer, much like capillary blood flow warms the feet of Antarctic penguins as they wait for their mates near the South Pole. 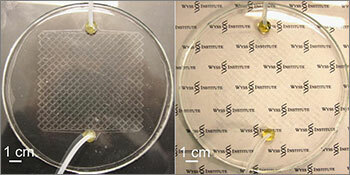 Hatton and the Wyss Institute team then created and tested a four-inch-square microfluidic windowpane. They found that when these channels were filled with water, they were also transparent to the eye — which is just what people want in a window, Hatton said. They then used a heat lamp to heat a pane with this vasculature to 100 F — as hot as a window might get on a sunny summer day. Using a special infrared camera, they showed that the circulatory system could readily cool the pane. The Wyss Institute team then worked with Matthew Hancock, an applied mathematician at the Broad Institute in Cambridge, Mass., who developed a mathematical model that predicts how the circulatory system would perform on normal-size windows. Pumping just half a soda can’s worth of water through the window’s circulatory system would cool a full-size window pane by a full 8 C (14 F), they calculated. The energy needed to pump water would be far less than the heat energy the water absorbed. This suggested that installing the cooled windows throughout a building would generate a big net win. “The idea of using nature’s lesson to create kind of a living skin on a building is a very important and promising direction for how buildings should and will be constructed in the future,” said Chuck Hoberman, an award-winning U.S. designer, expert in adaptive architecture, and Wyss Institute Visiting Scholar. Next, the researchers plan to team up with architecture researchers to meld their mathematical model with existing architectural energy-modeling software to see how much energy microfluidic windows would save if installed over an entire building. This work was funded by the Wyss Institute. In addition to Hatton, Aizenberg, Ingber and Hancock, the research team included: Ian Wheeldon, Ph.D., a former Wyss postdoctoral researcher who’s currently an assistant professor in the department of chemical and environmental engineering at the University of California, Riverside, and Matthias Kolle, Ph.D., a postdoctoral fellow on Aizenberg’s team.